Unenhanced head computed tomography (CT) scan demonstrating a subacute L posterior cerebral artery (PCA) infarct. Computed tomography (CT) scan of the brain showing hypodense areas in the right occipital lobe consistent with a recent posterior cerebral artery (PCA) ischemic infarct. The posterior cerebral arteries (PCAs) are paired vessels, usually arising from the top of the basilar artery and curving laterally, posteriorly, and superiorly around the midbrain. The PCAs supply parts of the midbrain, subthalamic nucleus, basal nucleus, thalamus, mesial inferior temporal lobe, and occipital and occipitoparietal cortices. In addition, the PCAs, via the posterior communicating arteries (PCOM), may become important sources of collateral circulation for the middle cerebral artery (MCA) territory. Various nomenclature methodologies have been used to describe PCA vascular anatomy. The PCA is divided into P1 and P2 segments by the PCOM. Penetrating branches to the mesencephalon, subthalamic, basal structures, and thalamus arise primarily from the P1 segment and the PCOM. These penetrating arteries include the thalamogeniculate, splenial (posterior pericallosal artery), and lateral and medial posterior choroidal arteries. The P2 segment bifurcates into the posterior temporal artery and the internal occipital artery. The posterior temporal artery further divides into anterior, middle, posterior, and hippocampal branches. The internal occipital artery divides into calcarine and occipitoparietal branches. The fetal PCA variant is seen in up to 30% of people, with incidence depending on how the variant is defined. The variant occurs when the P1 segment is congenitally absent or markedly hypoplastic and the PCA arises directly from the ipsilateral internal carotid artery (ICA). This can have diagnostic importance, in that PCA territory stroke may be caused by atheromatous disease of the anterior circulation (ie, ipsilateral carotid bulb atheroma). The central artery of Percheron variant is uncommon and occurs when the bilateral medial thalamic/rostral midbrain perforators arise from a single trunk from one P1 segment. Occlusion may result in bilateral paramedian thalamic and rostral midbrain infarction. This is an example in which a single cerebral artery supplies bilateral structures. This syndrome results from bilateral medial thalamic infarction. The presentation in these patients varies from lethargic to obtunded to comatose, but some patients may be agitated and may have associated hemiplegia or hemisensory loss. Occasionally, the cranial nerve III nucleus is involved, with resultant ophthalmoplegia. Patients may take days to weeks to recover and seem to be in a sleeplike state. Although alertness generally returns, prognosis for good functional recovery is poor because of severe memory dysfunction. The syndrome may result from a “top of the basilar” artery embolus. The artery of Percheron may be involved. Unilateral infarction produces homonymous hemianopia. Sparing of the macula is encountered frequently in infarction of the occipital lobes due to PCA occlusion. Macular sparing may be caused by collateral vascular supply to the macular region or by the very large macular representation in the occipital cortex; additionally, bilateral representation of macular vision has been suspected. Bilateral infarctions of the occipital lobes produce varying degrees of cortical blindness depending on the extent of the lesion. Patients often exhibit Anton syndrome, a state in which they fervently believe they can see when they cannot. Patients may describe objects that they have not seen previously in exquisite detail, completely in error and oblivious to that error. Another intriguing phenomenon is blindsight. Although cortically blind, patients can respond to movement or sudden lightening or darkening of their environment. Infarction of the lateral geniculate nucleus may produce hemianopia, quadrantanopia, or sectoranopia. The vascular supply is dual; the anterior choroidal artery supplies the anterior hilum and anterolateral areas, and the posterior choroidal artery supplies the rest. Occlusion of the posterior choroidal artery may produce a distinct syndrome of hemianopia, hemidysesthesia, and memory disturbance due to infarction of the lateral geniculate, fornix, dorsomedial thalamic nucleus, and posterior pulvinar. This refers to a lack of recognition or understanding of visual objects or constructs. It is a disorder of higher cortical function. The strict diagnosis of visual agnosia requires intact visual acuity and language function. Most patients have bilateral lesions, sparing the visual cortex but disrupting or disconnecting visual information; this interferes with the information’s ability to reach parts of the visual association cortex, for reference to visual memories. The patient with visual agnosia can recognize objects presented to a nonvisual sensory system; for example, the patient can identify keys by palpating them or hearing them jingle. True visual agnosia has been divided into apperceptive and associative subtypes. In apperceptive visual agnosia, patients cannot name objects presented to them, draw objects from memory, or identify or match objects, yet they can see and avoid obstacles when ambulating and detect subtle changes in light intensity. In associative agnosia, patients can draw objects to command and can match them or point to them, but they cannot name them. Patients can see shapes and reproduce them in drawings, yet they do not recognize the identity of objects. Prosopagnosia refers to an inability to recognize faces. Typically, this deficit results from bilateral lesions of the lingual and fusiform gyri; however, cases of unilateral nondominant-hemisphere lesions resulting in prosopagnosia have been reported. These are illusory phenomena that are of uncertain pathophysiology. Palinopsia describes the persistence of a visual image for several seconds to days in a partially blind hemifield. Micropsia and macropsia describe situations where objects appear smaller or larger than expected. Pure alexia may result from infarction of the dominant occipital cortex. Words are treated as if they are from a foreign language. Patients may retain the ability to formulate a word and its meaning if spelled out to them orally or if they trace the letters with their hand. Patients may then learn to read, albeit terribly slowly, in a letter-by-letter fashion, being unable to integrate multiple letter groups. Classic alexia without agraphia was described by Dejerine in the late 19th century. In his case study, he emphasized a left occipital cortex lesion and also infarction of the splenium of the corpus callosum, which disconnected fibers from the right occipital lobe, preventing them from reaching the angular gyrus. Rarely, the dominant-hemisphere posterior temporal lobe is supplied by the PCA. Damage to this area results in a Wernicke-type aphasia with associated dyslexia and right hemianopia due to concomitant left occipital infarction. Lesions of the lingual gyrus in the inferior occipital lobe may produce disorders of color perception. Testing with Ishihara plates reveals a deficit. Colors may be described as washed out or gray. This deficit usually occurs only in the contralateral visual field and is called hemiachromatopsia. A related problem is color anomia, also called color agnosia, in which patients can perceive and match colors but cannot associate them with the proper color names. Infarction of the medial temporal lobe, fornices, or medial thalamic nuclei may result in permanent anterograde amnesia. Although traditionally, bilateral infarction has been thought to be required for amnesia, memory functions may be lateralized such that infarction of left-sided structures may have a more lasting impact on verbal function. Older patients frequently have lasting short-term memory impairment from unilateral PCA territory infarction. In addition, diffusion-weighted Imaging in patients with transient global amnesia has demonstrated lesions in unilateral temporal lobes resulting in temporary amnesia. When the blood supply to the cerebral peduncles arises from perforators of the P1 segment, infarction may occur, resulting in hemiplegia or hemiparesis. The clinical syndrome is no different from capsular infarction but often includes concomitant hemianopia because of occipital lobe involvement. 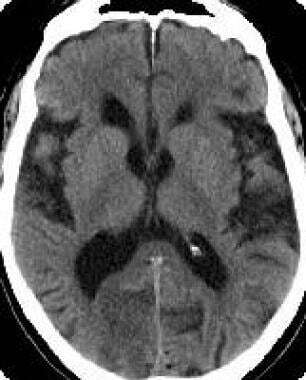 The syndrome may mimic a large middle cerebral artery (MCA) infarction. Ischemic stroke occurs when a region of cerebral blood flow is suddenly limited. This may occur by vessel occlusion or by relatively low flow. The rate of neuronal death varies with blood flow, variability in individual anatomy and collateralization, and inherent cerebral capacities (ie, some cerebral regions are more resistant than others). Cerebral blood flow (CBF) rates of less than 20 mL/100 g/min may produce infarction depending on these individual differences plus the duration of oligemia, with lower CBF rates (< 10 mL/100 g/min) requiring less time to produce irreversible injury. Rapid restoration of blood flow is the most effective means of preserving brain tissue. Less common etiologies include migrainous cerebral infarction (which preferentially affects the PCA distribution), anterior circulation disease (when fetal PCA variant is present), hypercoagulable disorders, illicit substance use, vasculitides, and fibromuscular dysplasia. Other sources of cardiogenic embolism include a mural thrombus on a hypokinetic wall segment (eg, postmyocardial infarction, dilated cardiomyopathy, ventricular aneurysm), endocarditis (bacterial, marantic, Libman-Sacks), prosthetic heart valve thrombosis, rheumatic heart disease, and paradoxical embolism via a patent foramen ovale or atrial septal defect. Embolism may also arise from aortic arch atheroma. This entity has been elucidated by transesophageal echocardiography, which is more effective than transthoracic echocardiography in examining the aortic arch. Thickness of plaque greater than 4 mm or the presence of a mobile thrombus is strongly associated with stroke. Atheromatous disease may be found within the vertebral artery in patients with posterior circulation ischemia and may result in stenosis or occlusion of that proximal vessel. This may result in hypoperfusion or artery-to-artery embolism involving the PCAs. Dissection of the vertebral arteries may result from trauma or occur spontaneously and result in arterial embolization. The vertebral arteries are uniquely prone to dissection due to their intracanalicular course within the vertebral bodies. (Some authorities have expressed concern that chiropractic manipulation of the neck may cause vertebral artery dissection.) PCA stroke secondary to vertebral artery dissection may occur when thrombus forms at an intimal tear and embolizes distally or when the dissection results in vessel stenosis/occlusion, with subsequent vascular stasis and embolism. Intrinsic basilar atheromatous disease may result in misery perfusion or artery-to-artery embolization in the PCA distribution. Intrinsic PCA stenosis from atherosclerosis is a less common, but recognized, cause of stroke. Migraine represents a particular challenge in stroke medicine. Migraine typically affects the posterior circulation, although the mechanisms by which stroke occurs are not known. However, numerous postulated mechanisms exist. Migraine alone commonly results in focal neurologic deficits, which may include visual loss, language disturbances, vertigo, nausea/vomiting, and other symptoms suggestive of posterior circulation disease (frequently known as complicated or basilar migraine). Furthermore, stroke in the posterior circulation distribution is more commonly associated with headache, occurring in approximately 30% of patients. Therefore, distinguishing between complicated migraine, migrainous cerebral infarction, and stroke with headache may be challenging. An estimated 5-10% of ischemic strokes in the United States involve the posterior cerebral artery (PCA) or its branches. While stroke is the third leading cause of death in the United States and the leading cause of adult disability, death from PCA stroke is uncommon and would more likely occur in the setting of concomitant brainstem infarction. Stroke is more common in African Americans than in white or Hispanic populations in the United States. Published data from the Tufts New England Medical Center posterior circulation stroke registry document that 58% of patients are male and 42% are female, with the mean age of stroke being 61.5 years. Stroke incidence dramatically increases in the elderly population secondary to cardiovascular disease. Mortality associated with isolated posterior cerebral artery (PCA) stroke is low; therefore, the prognosis is generally good. Visual field deficits improve to varying degrees; however, they may be permanent and associated with morbidity. Some neuropsychological deficits may improve with time but are also associated with morbidity. On average, patients with posterior cerebral artery (PCA) stroke sustain minimal or no chronic motor disability. These patients are usually able to adapt to their visual deficit so that many ADL tasks are manageable. Among young stroke victims, 30-70% return to work, with the higher fraction being men and those educated beyond high school. Recovery of visual field deficits may be limited; patients may be unable to drive or read, resulting in major limitations in their quality of life, despite normal motor function. Other neuropsychological deficits may include prosopagnosia (inability to recognize faces), visual agnosia, amnesia, and alexia without agraphia. Rarely, PCA stroke results in infarction of the ipsilateral cerebral peduncle with resultant hemiplegia. Thalamic involvement can also produce contralateral sensory loss or chronic pain syndromes. Since a delay in receiving emergency care is the major reason why patients cannot be treated with thrombolytic therapy, patients and their caregivers must be taught what to do if a stroke occurs. Patients should be instructed to call an ambulance (ie, call 911) if they or their friends/relatives suffer from any of the above symptoms. For patient education information, see the Brain and Nervous System Center and the Cholesterol Center, as well as Stroke, High Cholesterol, and Cholesterol FAQs. Adams DS. Stroke rehabilitation: indications, outcomes, recent developments. J La State Med Soc. 1996 Nov. 148(11):498-502. [Medline]. Arboix A, Arbe G, García-Eroles L, Oliveres M, Parra O, Massons J. Infarctions in the vascular territory of the posterior cerebral artery: clinical features in 232 patients. BMC Res Notes. 2011 Sep 7. 4:329. [Medline]. [Full Text]. Kwon JY, Kwon SU, Kang DW, Suh DC, Kim JS. Isolated lateral thalamic infarction: the role of posterior cerebral artery disease. Eur J Neurol. 2012 Feb. 19(2):265-70. [Medline]. Yamamoto Y, Georgiadis AL, Chang HM, Caplan LR. Posterior cerebral artery territory infarcts in the New England Medical Center Posterior Circulation Registry. Arch Neurol. 1999 Jul. 56(7):824-32. [Medline]. Middleton S, McElduff P, Ward J, Grimshaw JM, Dale S, D'Este C, et al. Implementation of evidence-based treatment protocols to manage fever, hyperglycaemia, and swallowing dysfunction in acute stroke (QASC): a cluster randomised controlled trial. Lancet. 2011 Nov 12. 378(9804):1699-706. [Medline]. Brandt T, Steinke W, Thie A, Pessin MS, Caplan LR. Posterior cerebral artery territory infarcts: clinical features, infarct topography, causes and outcome. Multicenter results and a review of the literature. Cerebrovasc Dis. 2000 May-Jun. 10(3):170-82. [Medline]. Devinsky O, Bear D, Volpe BT. Confusional states following posterior cerebral artery infarction. Arch Neurol. 1988 Feb. 45(2):160-3. [Medline]. Capitani E, Laiacona M, Pagani R, Capasso R, Zampetti P, Miceli G. Posterior cerebral artery infarcts and semantic category dissociations: a study of 28 patients. Brain. 2009 Apr. 132:965-81. [Medline]. Barbeau H, Norman K, Fung J, Visintin M, Ladouceur M. Does neurorehabilitation play a role in the recovery of walking in neurological populations?. Ann N Y Acad Sci. 1998 Nov 16. 860:377-92. [Medline]. Goehre F, Jahromi BR, Hernesniemi J, Elsharkawy A, Kivisaari R, von Und Zu Fraunberg M, et al. Characteristics of posterior cerebral artery aneurysms: an angiographic analysis of 93 aneurysms in 81 patients. Neurosurgery. 2014 Aug. 75(2):134-44; discussion 143-4; quiz 144. [Medline]. Hanlon RE, Dobkin BH, Hadler B, Ramirez S, Cheska Y. Neurorehabilitation following right thalamic infarct: effects of cognitive retraining on functional performance. J Clin Exp Neuropsychol. 1992 Jul. 14(4):433-47. [Medline]. Hassid EI. Neuropharmacological therapy and motor recovery after stroke. Mil Med. May 1995. 160(5):223-6. Rose FD, Brooks BM, Attree EA, Parslow DM, Leadbetter AG, McNeil JE, et al. A preliminary investigation into the use of virtual environments in memory retraining after vascular brain injury: indications for future strategy?. Disabil Rehabil. 1999 Dec. 21(12):548-54. [Medline]. Del Zoppo GJ, Saver JL, Jauch EC, Adams HP Jr. Expansion of the time window for treatment of acute ischemic stroke with intravenous tissue plasminogen activator: a science advisory from the American Heart Association/American Stroke Association. Stroke. 2009 Aug. 40(8):2945-8. [Medline]. [Full Text]. Rothwell PM. Is intravenous recombinant plasminogen activator effective up to 4.5 h after onset of ischemic stroke?. Nat Clin Pract Cardiovasc Med. 2009 Mar. 6(3):164-5. [Medline]. Hacke W, Kaste M, Bluhmki E, Brozman M, Dávalos A, Guidetti D, et al. Thrombolysis with alteplase 3 to 4.5 hours after acute ischemic stroke. N Engl J Med. 2008 Sep 25. 359(13):1317-29. [Medline]. Wahlgren N, Ahmed N, Dávalos A, Hacke W, Millán M, Muir K, et al. Thrombolysis with alteplase 3-4.5 h after acute ischaemic stroke (SITS-ISTR): an observational study. Lancet. 2008 Oct 11. 372(9646):1303-9. [Medline]. Adams HP Jr, del Zoppo G, Alberts MJ, Bhatt DL, Brass L, Furlan A, et al. Guidelines for the early management of adults with ischemic stroke: a guideline from the American Heart Association/American Stroke Association Stroke Council, Clinical Cardiology Council, Cardiovascular Radiology and Intervention Council, and the Atherosclerotic Peripheral Vascular Disease and Quality of Care Outcomes in Research Interdisciplinary Working Groups: the American Academy of Neurology affirms the value of this guideline as an educational tool for neurologists. Stroke. 2007 May. 38(5):1655-711. [Medline]. [Full Text]. Kim YB, Lee JW, Huh SK, Kim BM, Kim DJ. Outcomes of multidisciplinary treatment for posterior cerebral artery aneurysms. Clin Neurol Neurosurg. 2013 Oct. 115(10):2062-8. [Medline]. The EC/IC Bypass Study Group. Failure of extracranial-intracranial arterial bypass to reduce the risk of ischemic stroke. Results of an international randomized trial. The EC/IC Bypass Study Group. N Engl J Med. 1985 Nov 7. 313(19):1191-200. [Medline]. Sandercock PA, Counsell C, Kamal AK. Anticoagulants for acute ischaemic stroke. Cochrane Database Syst Rev. 2008 Oct 8. CD000024. [Medline]. Hallevi H, Albright KC, Martin-Schild S, Barreto AD, Savitz SI, Escobar MA, et al. Anticoagulation after cardioembolic stroke: to bridge or not to bridge?. Arch Neurol. 2008 Sep. 65(9):1169-73. [Medline]. [Full Text]. Amarenco P, Bogousslavsky J, Callahan A 3rd, Goldstein LB, Hennerici M, Rudolph AE, et al. High-dose atorvastatin after stroke or transient ischemic attack. N Engl J Med. 2006 Aug 10. 355(6):549-59. [Medline]. de Monyé C, Dippel DW, Siepman TA, Dijkshoorn ML, Tanghe HL, van der Lugt A. Is a fetal origin of the posterior cerebral artery a risk factor for TIA or ischemic stroke? A study with 16-multidetector-row CT angiography. J Neurol. 2008 Feb. 255(2):239-45. [Medline]. Finelli PF. Neuroimaging in acute posterior cerebral artery infarction. Neurologist. 2008 May. 14(3):170-80. [Medline]. Hasso AN, Stringer WA, Brown KD. Cerebral ischemia and infarction. Neuroimaging Clin N Am. 1994 Nov. 4(4):733-52. [Medline]. Kapoor K, Singh B, Dewan LI. Variations in the configuration of the circle of Willis. Anat Sci Int. 2008 Jun. 83(2):96-106. [Medline]. Kwak JH, Choi JW, Park HJ, Chae EY, Park ES, Lee DH, et al. Cerebral artery dissection: spectrum of clinical presentations related to angiographic findings. Neurointervention. 2011 Aug. 6(2):78-83. [Medline]. [Full Text]. NINDS and Stroke rt-PA Stroke Study Group. Tissue plasminogen activator for acute ischemic stroke. The National Institute of Neurological Disorders and Stroke rt-PA Stroke Study Group. N Engl J Med. 1995 Dec 14. 333(24):1581-7. [Medline]. Steinke W, Mangold J, Schwartz A, Hennerici M. Mechanisms of infarction in the superficial posterior cerebral artery territory. J Neurol. 1997 Sep. 244(9):571-8. [Medline]. Sylaja PN, Puetz V, Dzialowski I, Krol A, Hill MD, Demchuk AM. Prognostic value of CT angiography in patients with suspected vertebrobasilar ischemia. J Neuroimaging. 2008 Jan. 18(1):46-9. [Medline]. 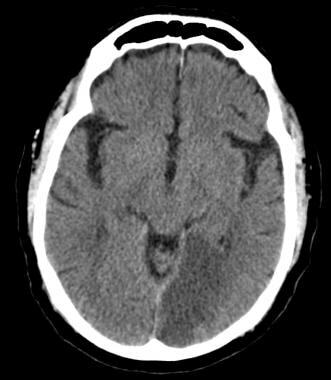 Unenhanced head computed tomography (CT) scan demonstrating hemorrhagic conversion of an ischemic stroke, approximately 72 hours after symptom onset. Brain magnetic resonance imaging (MRI) scan demonstrating acute stroke. Diffusion restriction is seen on diffusion-weighted imaging. Magnetic resonance (MR) angiogram demonstrating bilateral fetal posterior cerebral artery (PCA) variants (black arrows) with the basilar artery terminating in bilateral superior cerebellar arteries (blue arrows). Digital subtraction angiogram demonstrating an acute L posterior cerebral artery (PCA) occlusion (red arrow) following balloon-assisted coiling of a basilar tip aneurysm. Digital subtraction angiogram demonstrating revascularization of acute L posterior cerebral artery (PCA) occlusion (red arrow) during a balloon-assisted basilar tip aneurysm revascularization with use of balloon angioplasty.